"Rodgers & Hammerstein Flourish in the Pop Singer's World For the first half of the 20th Century, Broadway showtunes and popular standards were virtually synonymous. Rock & roll and the turbulent '60s changed all that, but Broadway has remained a rich and vibrant wellspring for that broadly-defined vocal artist known as the pop singer. From Sinatra to Streisand, Weslia to Mary Cleere, singers have remained faithful to the standards - and the standard bearers: Rodgers & Hart, Berlin, Porter, Gershwin, Kern, etc. 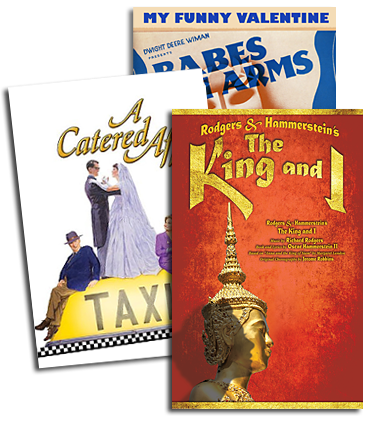 Rodgers & Hammerstein's innovative works of music theatre, however, challenged the singer, offering scores which were crucial components of a whole that defined character, provided subtext, and moved the story forward. Because of this synergy between dramatic content and song, their body of work seemed resistant to performance out of context. Many a number (like ""My Funny Valentine"" from Rodgers & Hart's BABES IN ARMS, or ""All the Things You Are"" from Kern & Hammerstein's VERY WARM FOR MAY) may have been nestled into a boy-gets-girl plot, but they could just as easily be plucked from that setting to glisten and gleam on their own. But in the Rodgers & Hammerstein canon, how do you solve a problem like ""Maria"" without imagining a chorus of Nuns? How do artists put their individual spin on a character song rooted in story? Vocal artists rose to the challenge and found a way. In a New York Times Magazine cover story last June on the American standard, Jesse Green wrote that ""a sturdily built song like 'Hello, Young Lovers' could be sung convincingly not only by Gertrude Lawrence at the St. James Theatre in THE KING AND I in 1951, but also by Mabel Mercer in her midnight show at the Byline Room, by Perry Como, by Josephine Baker, by the Temptations. By anyone, anytime,"" Green concludes, ""who understands the complexities of loss."" Frank Sinatra never got closer to playing an R&H role than his tantalizing ""almost"" as Billy Bigelow in the movie version of CAROUSEL (dropping out after a few weeks of shooting due to a contract dispute.) But the lack of a theatre resume didn't stop him from responding to their songs: Sinatra was one of the first pop singers to record Rodgers & Hammerstein, starting the first year OKLAHOMA! was on Broadway (1943), and continuing with at least two cover versions from each of the next five scores R&H wrote, including a noteworthy performance of the ""Soliloquy"" which proved that this ten-minute monologue could stand on its own. Sinatra's committed artistry to R&H is evident in Columbia/Legacy's new compilation, SINATRA SINGS RODGERS & HAMMERSTEIN, featuring vintage recordings along with several previously unreleased radio airchecks and alternate takes. ""One of the many great things about Sinatra,"" writes Will Friedwald in his liner notes, ""is that he's both a [Lorenz] Hart and a Hammerstein kind of singer. He can subtly move from Hart's one-to-one intimacy, to Hammerstein's man-and-the-universe ideals, without ever missing a beat."" Along with the Sinatra reissue, new recordings of the past few years have shown a strong bond between today's singers and Rodgers & Hammerstein. ""Climb Ev'ry Mountain"" and ""You'll Never Walk Alone"" form part of Laurie Beechman's newest album, NO ONE IS ALONE: SONGS OF INSPIRATION FROM BROADWAY (Varse Sarabande); ""What's the Use of Wond'rin'?"" is on Bernadette Peter's newest album, I'LL BE YOUR BABY TONIGHT (Angel); ""Hello, Young Lovers"" and ""Some Enchanted Evening"" are performed by Betty Buckley on her live album, AN EVENING AT CARNEGIE HALL (Sterling); ""If I Loved You"" appears, heartbreakingly, on Nancy LaMott's posthumous album, WHAT'S GOOD ABOUT GOODBYE (Midder Music); and more than half of Phillip Officer's all-Hammerstein album, MANY A NEW DAY (Original Cast Records), is comprised of numbers written with Rodgers for rich character moments: ""Honeybun,"" ""The Surrey with the Fringe on Top,"" ""Shall We Dance?"" Mandy Patinkin, who tackled CAROUSEL's ""Soliloquy"" on his first solo album (CBS), devoted a recent album (OSCAR & STEVE; Nonesuch) to Hammerstein and his protege, Stephen Sondheim. All the songs on this album were created with particular characters and specific situations in mind, yet Patinkin deftly removes them from their dramatic contexts and lets them fly. He is successful at being audaciously original yet true to the works' intent, letting his listeners make their own connections between CAROUSEL's ""If I Loved You"" and PASSION's ""I Wish I Could Forget You""; ""Bali Ha'i"" and ""Poems""; the teacher: ""You've Got To Be Carefully Taught,"" and the pupil: ""Children Will Listen."" On her landmark recording, THE BROADWAY ALBUM (Columbia) Barbra Streisand interwove ""I Have Dreamed"" and ""We Kiss in a Shadow"" to stunning effect, building majestically to ""Something Wonderful,"" thereby achieving a thrilling, triangular structure among three songs from THE KING AND I that commented on the original even as they stood on their own. Carly Simon too took the anthem that Lady Thiang delivers to Mrs. Anna in THE KING AND I and transformed it into, well, something wonderful - a smoldering torch number, fitting comfortably alongside ""Little Girl Blue"" and ""My Funny Valentine"" on her 1990 album, MY ROMANCE (Arista). At this writing, Barbara Cook is recording a new album scheduled for a late March release on DRG. One of the most beloved stars of the musical stage in the golden days of the '50s and '60s, Cook has made the road from theatre to concert and cabaret look smooth and easy. With her newest album, entitled OSCAR WINNERS, she will merge her two worlds into one with a tribute to Oscar Hammerstein II and his extraordinary body of work. ""There isn't anybody better suited to do this album than Barbara,"" says Hugh Fordin, producer for DRG Records. ""She understands those words and their meaning, not as pop songs but as theatre songs. Hammerstein's songs tell a story and Barbara is a storyteller."""